I owe you a finished object report, and assuming MJ delivered them this morning according to plan, here are my Ka-Vangeline mitts. Pattern: Evangeline, available only as a free Ravelry download, since Magknits fell off the face of the earth. I did the short version, as written, save the thumb. The recipient has short fingers, so I only did five rounds on the thumb. I REALLY liked this pattern! Yarn: Bernat Natural Cashmere. (Which actually has only a TINY amount of the good stuff in it, not even enough to tempt Gretchen.) I liked it though, right much for an acrylic blend. Didn’t even use a whole skein, so I have enough to do another pair for me. Needles: US #6 KA bamboo circs. I like KA bamboo, I really do. Now, to go decorate for that dance! Sissy was delighted that so many of you were worried about her lack of cowl in yesterday’s post. So for the lurkers and those who didn’t ask, she wore her cowl out the twenty times prior to the photos. The cowl was soaked – freezing rain, anyone? – so I decided she was better off without a cold, wet, pneumonia necklace. Rest assured, Sis loves her cowl and had it on this morning. Grab a snack, a beverage and plop down somewhere comfortable. This is gonna’ be a long one. Firstly, I failed to note that yesterday was Gretchen’s five-month birthday. She’s really starting to develop what I assume is going to be her adult personality. She’s affectionate, confident, and lives to please. 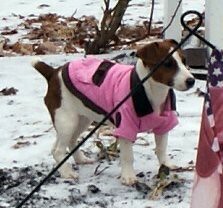 None of that is new, but she is starting to become more independent, in true JRT fashion though, which is to say that she is loyal to her pack and wants them VERY near, but she picks moments to express herself. Now, an FO report. 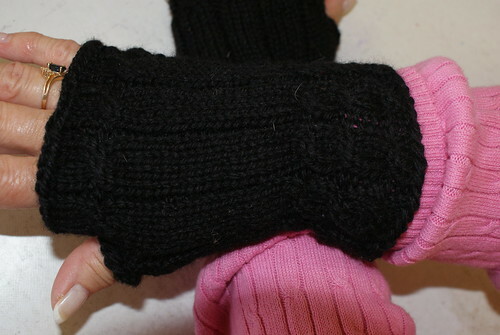 MJ had requested black mitts, so I complied. Pattern: Fetching. I used a worsted weight yarn and smaller needles, but the only real change I made to the pattern was I eliminated the picot bind off. MJ has small hands, so there was no need for looser or longer. Yarn: Patons Classic Wool, in black. (Hence, the lack of detail in the photos.) A great, basic wool. I think this is my go-to, worsted wool. Mitts would be my new socks if not for the fact that here in the freezing rain zone, there’s still more need for warm socks than a collection of mitts. I can surely see why this pattern is so popular. I also got a happy package in the mail yesterday. So, tell me ’bout your weekend! We have an all-day scrapping event planned tomorrow, but I need to run out to Pins & Needles (my favorite LYS, no website yet) before I settle in for a few hours. Tonight, I’m going to push to finish the legs and maybe start the heels on my socks in progress. (And yes G, I am into the legs!) I’m trying the afterthought heel for the first time… Sunday, I think we’re having breakfast with Bubba and his wife (maybe their teen son too, if we’re lucky; he’s a great kid, but we’re not cool enough to always get him to join us), and then I have the one o’clock meeting I slept through last Sunday. 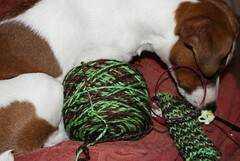 I’ll be starting another pair of socks for my Super Bowl knitting, because I don’t have other knits I should be doing. Hem. I’m pretty excited. Not only are the Steelers in the big game, but the Knight will actually be watching with me for a change. He’s in a pool of some sort, so suddenly, he cares. I just deleted my whiner post. I’ve been sitting here jamming to It Happens by Sugarland, that says it all, except for the minor detail of the Knight turning the alarm clock off last night! 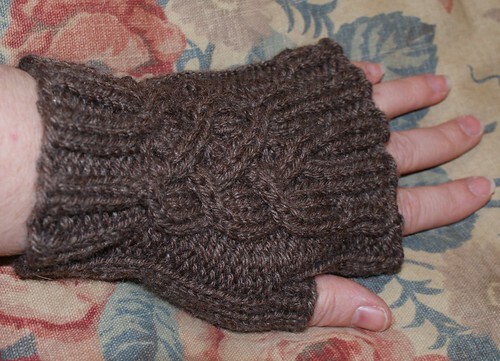 Pattern: Kathy‘s quick and easy Wooly Warm Mitts. 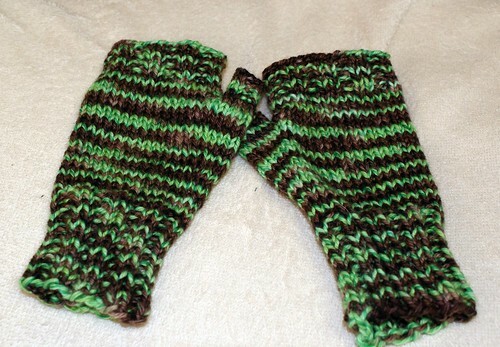 They’re also my first pair of mitts, so I went out of my way to find a pattern I couldn’t mess up. 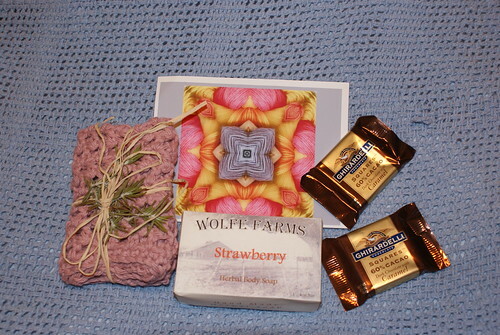 Thanks, Kathy! I’m now a mitt fan. Yarn: Swoon. I think this yarn was my first Etsy purchase, but I know it was my first stash enhancement from Jessi. I’m delighted that I have more Alabama Fiber Dreams yarn in my stash, because this stuff even meets Gretchen’s approval. 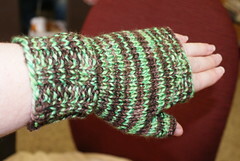 It’s a worsted weight wool in a colorway called Grasshopper. I can’t find the tag, so contact Jessi for more information. I’m not sharing! In fact, I enjoyed this yarn so much that I immediately cast on for another project with the rest, but that’s for another day. Needles: Knitpicks Options Harmony tips, size #8. So, my weekend? That meeting and some wine, tonight. 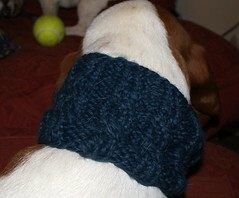 I’ll also finish up the matching neck and/or ear warmer tonight. Tomorrow, if we don’t have snow, I’ll go get new glasses. I do want to try contacts one more time, but my left lens is cracked, so I don’t have a choice. Then, I’ll block a little lace, work on my lace ribbon scarf (maybe finish it? ), go to FIL’s birthday dinner (um, order him a gift certificate from ____ [just in case he reads]), and go grocery shopping. That’s all I have planned! What do your weekend plans include?